I tasted burger for the first time when i was travelling to Paris from India, to be honest its was my first worst experience with burgers. However later, burger became a part of our monthly menu, my kids loves burger very much. Earlier i usually get them from stores, but when realized that burgers are not that much difficult to dish out at home i started preparing them myself at home. Though kids loves non vegetarian burgers, i do prepare some vegetarian burgers. Burgers are definitely a super filling meal when served with some salads, however i always plan to prepare burger at home for dinner. Since we all dont have lunch together at home, its better to have burger altogether for dinner na. However kids loves burgers very much with their favourite french fries. When i picked Black bean as the ingredient for this week's marathon, the first dish came to my mind is Black bean burger. Am running Mega marathon for this whole month and i picked 5 ingredients for 5 weeks as theme under Cooking Carnival. 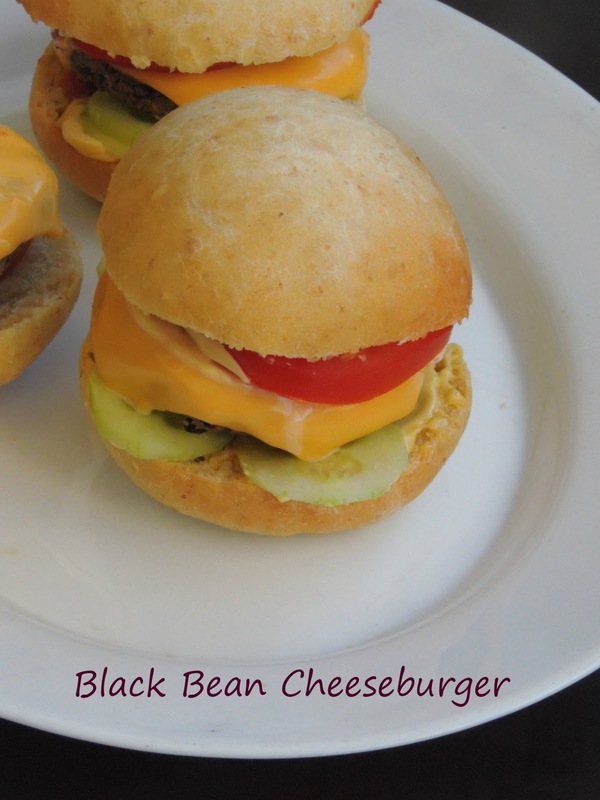 Coming to this Homemade black bean burger, this sandwich will definitely satisfy your craving for a tasty veggie burger which is quite easy to make and more healthy than the storebought ones. Though varieties of meatless burgers do exists in the world, i just love this satisfying healthy burger just to fill some hungry tummies. Since i want to keep the black bean patties simple i didnt want to add more vegetables, however if you want a different burger, you can add some sweet corn kernels, leftover cooked rice or else some potatoes. 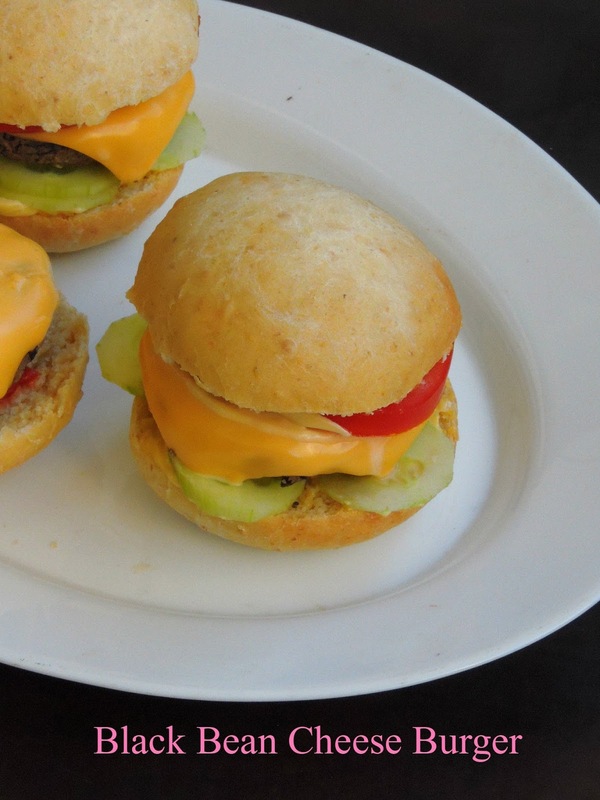 Trust me, everyone at home enjoyed this incredible cheesy burgers for their dinner. Heat few drops of oil,saute the onions and garlic cloves until they turns transculent. Take the cooked blackbeans, bread crumbs,salt, cumin seed powder, sauteed onions and garlic and grind as bit coarse paste. Divide the paste as medium balls, flatten each balls gently as patties. Heat oil and shallow fry the patties until they gets well cooked. Drop the cheese slices over the patties and let them melt. 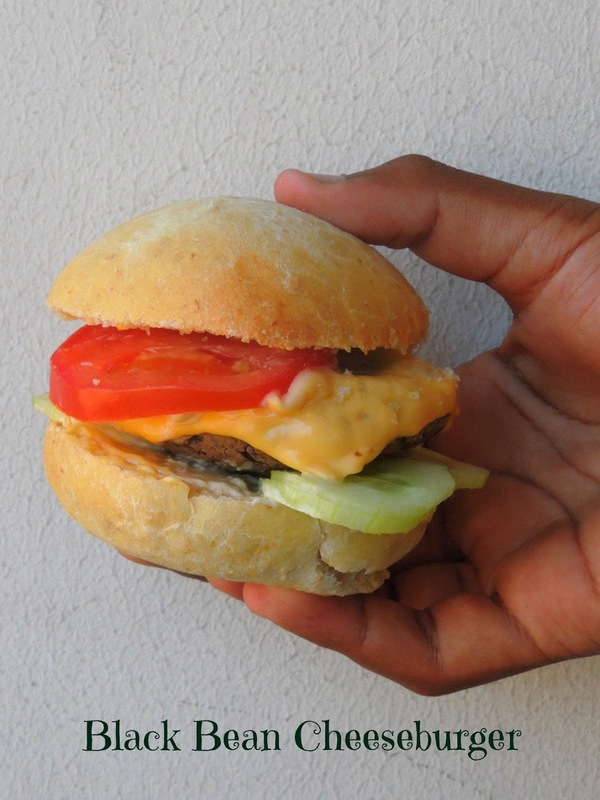 Slice a bun, spread enough mayonnaise, top it with a black bean patty with the melted cheese, sliced tomatoes and some cucumber slices. Now spread again mayonnaise to the remaining slice and make the burger. I am sure the black beans patty must've tasted awesome , i am drooling over these burgers , i specially like the idea of melting the cheese slice . I am feeling hungry looking at that burger... so good! It is lunch time here and your awesome burger is making me hungry..
Black beans patty is a wonderful veg substitute and burger looks yum!! I make these black bean burger patties and freeze them so such burgers can be prepared on demand. Those burgers look pretty cute and those nutritious bean patties make a great vegetarian option. Love that burger.. amazing veggie burger. Such a healthy and filling burger,must have tasted Awesome. I make these with Rajma / chickpeas and we love it :) liked that candid shot against the wall ! I love black bean burger and I make them as often as I can. I freeze the burgers and then I have it ready all the time. Awesome. I love these burgers they sound delicious. Such a yummy burger with black beans patty. Loved all the cheese in there!! Black bans are great to make burgers -- they taste so meaty and delicious. Black bean burger is one of my favorite.Looks too good. Gosh those cheese burgers must have tasted so good priya...imagine not liking burgers..heheh..
Aww, can i take it from the picture, droolicious priya!! !